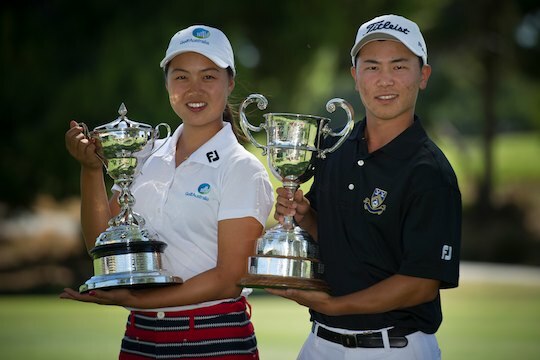 Min Jee Lee and New Zealander Tae Koh have won the Australian Amateur Championship titles in convincing fashion at The Grange Golf Club in Adelaide. Lee was too strong over Karis Davidson winning successive Australian Amateur Women’s titles with a 6&5 victory after claiming last year’s trophy at the Commonwealth Golf Club in Victoria. In the Men’s Championship, Koh never let Western Australian Curtis Luck into the final, taking the lead early to be at one stage 4-up on the front nine before going on to secure a solid 6&5 win. Both finals turn out to be a relatively one sided affair, Lee exhibiting pin positioning from the tee, whilst Koh’s short game was his saviour. Both Lee and Koh were effectively able to shut out their opponents early, never letting them back into the match. Koh becomes the first New Zealand-based golfer since Michael Campbell to win the Australian Men’s championship, with Lee the first back-to-back winner of the Women’s title since Michelle Ellis in 1998. Both Koh and Lee earn an exemption into the Australian Open Championships. Lee has also accumulated both the US Junior Championship and the Australian Amateur. In 2011, she won the Singapore Ladies Amateur championship. Currently Lee is playing a different game to that of her competitors, stamping her position on amateur women’s golf, not just at home but internationally. The world number five’s immediate plans are to play the APLG Tour events this season, starting with the NSW Open at Oatlands Golf Club next week, and then go to China for the World Ladies Championship. After that Lee plans to head to the United States for the US Women’s Amateur. For Koh this was his first major international title and on his way to the final, he accounted for a number of high profile players including Todd Sinnott on the 18th in yesterday’s semi-final and American Max Buckley. The men’s championship was a title up for the taking following the early elimination of a number of our main amateurs including Taylor MacDonald’s loss in the 3rd round to rising star Cameron Davis, Anthony Murdaca’s loss to Koh in yesterday’s semi-final, Geoff Drakeford’s exit in the 3rd round and the top-seed England’s Ryan Evans removal on the opening day. For many of our elite male amateurs these Australian Amateur Championships were a lost opportunity. Some simply did not step up to the plate and perform in Adelaide when the heat was on. Others made silly mistakes when caution was called for. Errors of such nature, as we saw, were costly. Opportunity often knocks softly, and this week in Adelaide some will be checking their hearing, as many are left wondering what it might have been had they been on song. Hopefully, they will see it as a work in progress and move on. They need to – otherwise aspirations will not be reached and they will ponder the mishaps of this week in Adelaide.